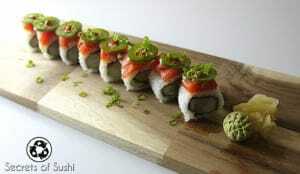 The Crazy Cajun Roll is a contemporary, American creation that is commonly found in the southern states of the U.S. 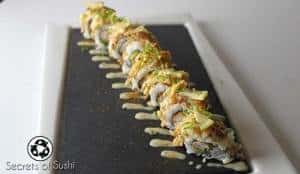 This roll is typically rolled as a short futomaki; that means that instead of using a half sheet of nori horizontally, you use it vertically instead. 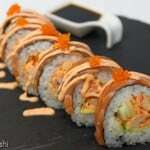 This will also result in the roll being cut into 6 pieces instead of 8. This recipe will make approximately 8 rolls. 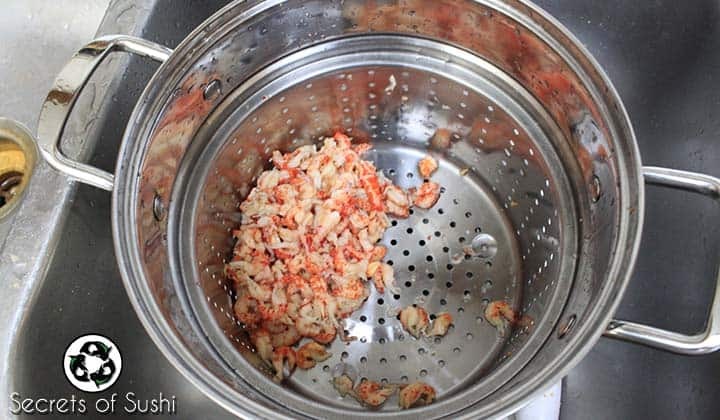 When you purchase the crawfish tail meat, it will be packaged in water and it will have a very potent smell to it. We will want to thoroughly wash the crawfish to remove the packaged smell and taste. 1. 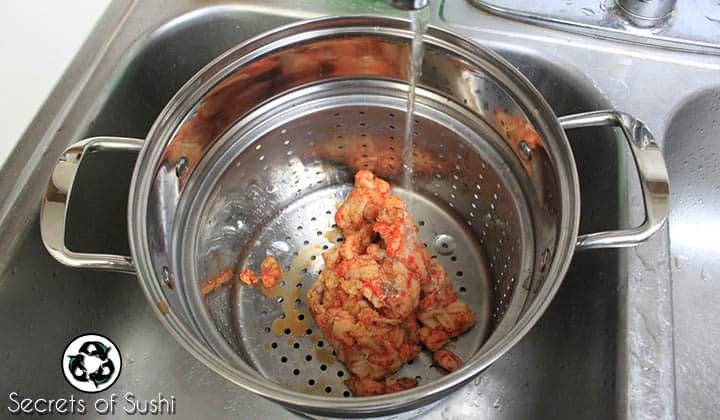 Start by dumping the contents of the bag into a colander and rinsing the meat in room temperature water. 2. Be sure to squeeze the crawfish meat until the water runs clear. You should notice that the color of the meat turns pale. 3. Once you are finished washing the crawfish, squeeze as much water out of the tail meat as you can and place them into a mixing bowl. 4. Add the Kewpie Mayonnaise, ShichimiTogarashi, Tobiko (or Masago), and Sri Racha into the bowl and mix thoroughly with a spoon. The crawfish salad should be thick and creamy. Now we are ready to move onto rolling! 1. 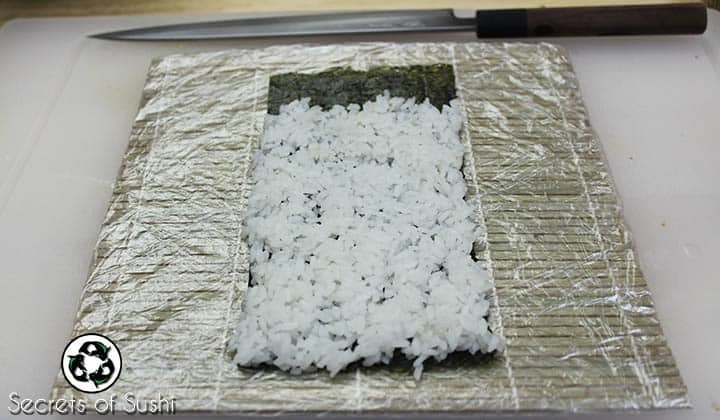 Lay out a half sheet of nori and apply your sushi rice. Make sure to leave about an inch (25mm) of space at the top. 2. Apply a 2cm diameter row of crawfish salad in the center of the rice. 3. Add your cucumber (cut Julienne) to the far side of the crawfish salad and the avocado to the side closest to you. 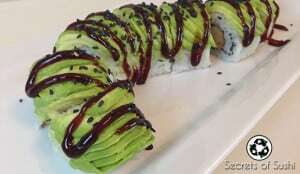 Having the avocado closer to you will ensure that it doesn’t get smashed during the rolling process. 4. 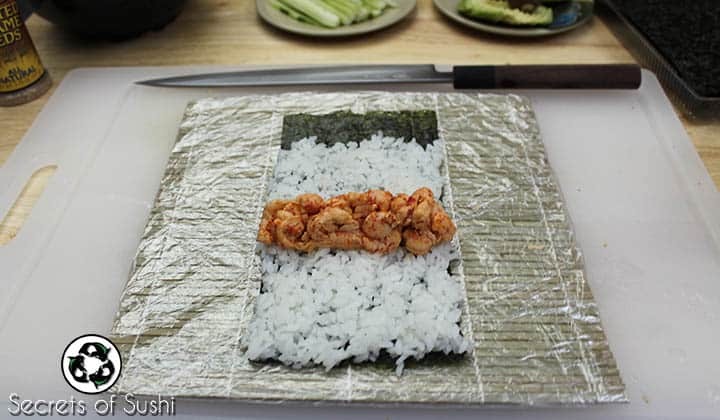 Referring back to the instructions on rolling a Half Futomaki, wet the top of the nori and roll it up. 6. Very carefully, place a piece a food service film (a.k.a. 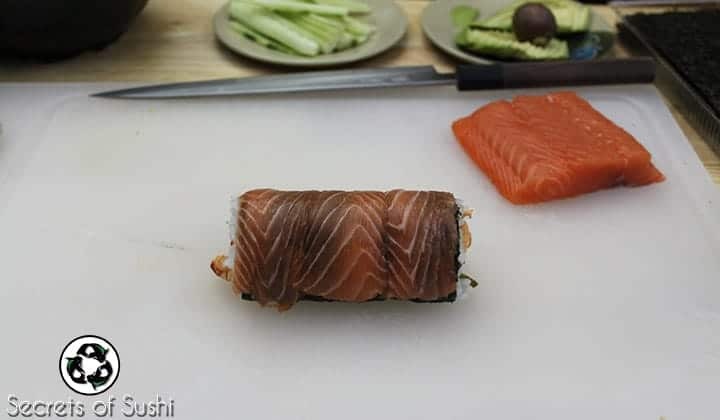 Saran Wrap) on top of the roll and press the salmon slices onto the roll using your makisu (sushi mat). 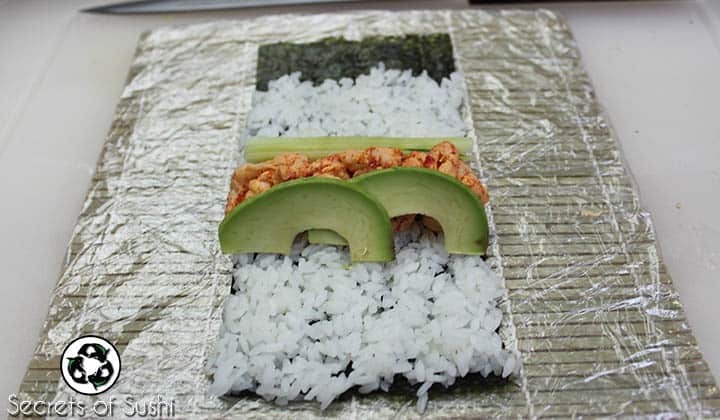 Now you can carefully slice the roll into 6 pieces. 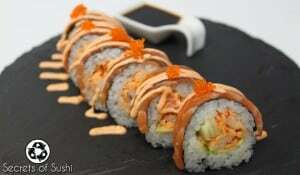 I usually start by slicing the roll in half and then slicing each half into thirds. 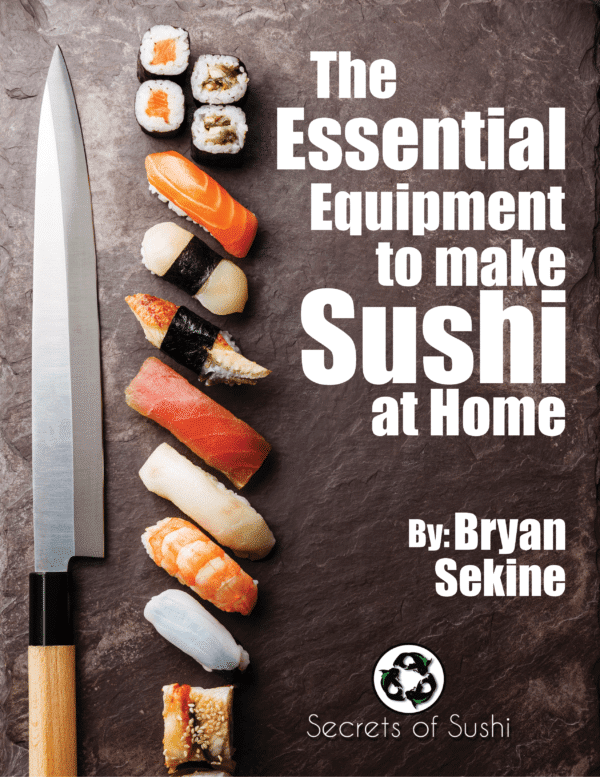 If the pieces become deformed from the slicing process, gently press them again with the makisu. 7. 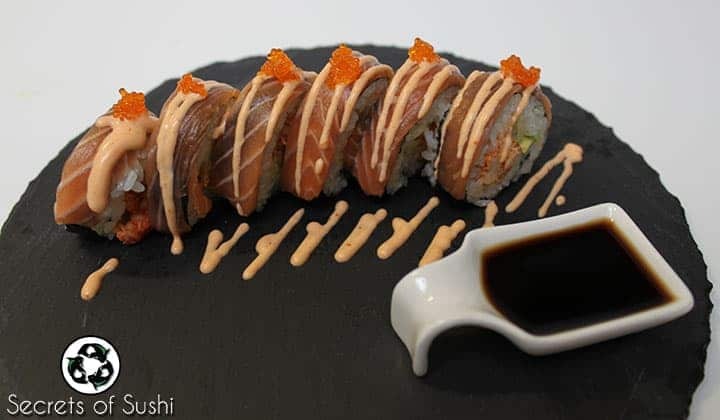 Lastly, place your pieces onto a plate, squeeze some Spicy Mayo on top, and at a pinch of Tobiko (or Masago) onto the top of each piece. You may also add some finely chopped scallions for additional flavor and color. 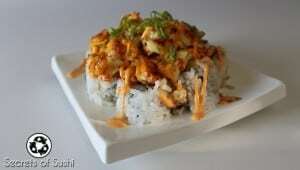 Enjoy your Crazy Cajun Roll!